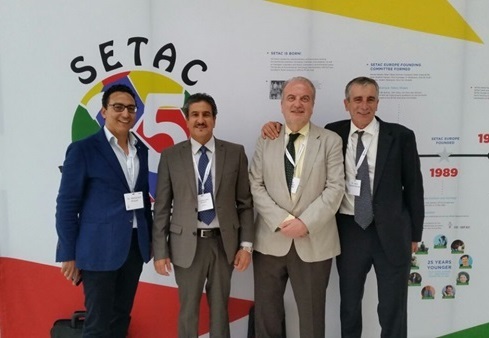 SETAC Europe’s 25th Annual Meeting, which took place in Barcelona from 3-7 May 2015, was the largest in the society’s history, and was accompanied by special 25th anniversary celebrations and events. The event featured scientific presentations from three past prizewinners who hail from Spain. Though they won very different prizes from PSIPW, their work is directly relevant to the concerns of SETAC. The first speaker was PSIPW’s 2012 Water Management and Protection Prize winner, Dr. Damià Barceló Cullerès from the Catalan Institute for Water Research. He presented a paper entitled: “Fate, Effects and Management of Emerging Contaminants in River Catchments under Water Scarcity”. The next speaker was the 2014 winner of the Groundwater Prize, Dr. Jesús Carrera Ramirez, from the Institute of Environmental Assessment and Water Studies, IDAEA (Barcelona). He presented: "A Brief Review of the Processes that Explain Why You Should Drink Groundwater"
The PSIPW film was also shown at the event. PSIPW also participated in the SETAC meeting’s various receptions and celebratory events, while student volunteers for SETAC, some of whom were colourfully dressed to celebrate the society’s 25th Anniversary, distributed the Prize brochure to delegates at the meeting’s Opening Session on Sunday, 3 May. The Society of Environmental Toxicology and Chemistry (SETAC) is a non-profit, worldwide professional society whose mission is to support the development of principles and practices for the protection, enhancement and management of sustainable environmental quality and ecosystem integrity. SETAC promotes the advancement and application of scientific research related to contaminants and other stressors in the environment, education in the environmental sciences, and the use of science in environmental policy and decision-making. The Society provides a forum where scientists, managers, and other professionals exchange information and ideas for the development and use of multidisciplinary scientific principles and practices leading to sustainable environmental quality.